By Vincent Morgan	| Published on Monday, October 12, 2009. 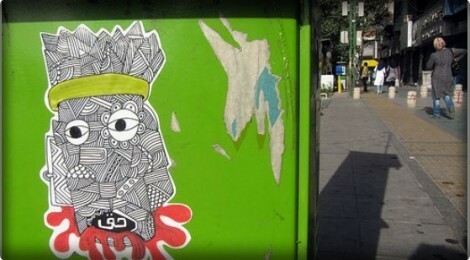 An introduction to graffiti and street art from Tehran through A1one a graffiti pioneer in his country. I ‘m born and living in Tehran / iran / middle east. I started my work from 2003 with stencil and then painting some simple eyes around the neighbourhood just to express my self, move general public mind and fulfil my energy to do crime. When I searched in internet about wall paintings, murals, sprays, I discovered graffiti and street art. I loved the concrete energy of this culture which help me continuously to find what I am. So I dedicated my energy in art-crime. I paint outdoor about twice a week but I do indoors to practice in my studio every day. Nowadays I got to main goals: the first one is to achieve my own style in stencilling and prints, and the second is establishing Arabic letter Graffiti styling. This last one is also one of my personal honors to make many versions of general graffiti and tagging fonts for Arabic letters. FC: How is the graffiti scene in your country? In Tehran Graffiti is both emerging and also not born yet. Tehran is really a big and developed town in our country but the number of writers is so low. For a city of 16 million of citizens we have about 30 writers. To be true, none of these writers are yet professional because all of them are between 16 to 22 years old and they are working their style from 3 years to 2 years ago. Most of them aren’t really doing daily or weekly art on streets. They do one work in a month or season. So we can say that graffiti is emerging in our country and particularly in Tehran. I worked from 2003 and focused on graffiti from that time and I’m glad to be respected by 90% of these mates. I meet graffiti artists in my exhibitions and we share tips and tricks. In the first years, I had some problems with 2 new comers who started to disrespect me by tagging on my works buffing it, changing my tags. But now it’s ok, they show respect. FC: How is the graffiti repression in Iran. Is it hard ? No laws yet. May be dangerous if they feel this may be political. It can be so easy to say “sorry I didn’t know it was a crime !”. Of course if you want to go really big and be known by every one it can be more dangerous. FC: Can you explain your name? I was alone in whole city when started, felt alone. I invited others while I was the the first: A the only 1 huh? In arabic and english language mix you can read it like : Al-one. Read it alvan : “alvan” means Colorful in arabic language. You can check A1one last work on his flickr or site. Largest floor painting titled « Lilith & Olaf » performed by the duo Ella & Pitr (Papier Peintres) in Stavanger, Norway during the Nuart festival.